This old tomintoul seems somehow out of round and absolutely unbalanced. The nose shows good beginnings with me here this strange slightly sprittige note something disturbs, tastes convinced me this malt also not 100% zig. Despite the high age, I miss the balance and an elegant character in this bottling. Light caramel rests in the glass, from a distance sweet vanilla and malty cereal notes are perceptible. Caramel and toffee come into their own, spritzig, apricots and mirabelle plumage are added. Creamy peach appears creamy, although unfortunately I do not get this sprightly, slightly sticky note out of my nose ... After a while, only vanilla, toffee, fresh sweetness and slightly malty cereals dominate. Meadow herbs and spicy oak tones are minimal, the nose noticeably gains in dynamics and complexity over time. Mandarins rose, with sweet sugar added. The spicy aromas on the palate are creamy-mild, yet voluminous and sombre, with slightly smoky notes of toasted cereals and tart wood tones. Creamy remnants of malt candy or breast cells float in the saliva, the aftertaste fades relatively quickly. Let’s finish with a rare vintage from Murray McDavid’s ‘Mission Gold’ series, alternatively coined [so aptly by DJ], as being part of the ‘intensive care range’. 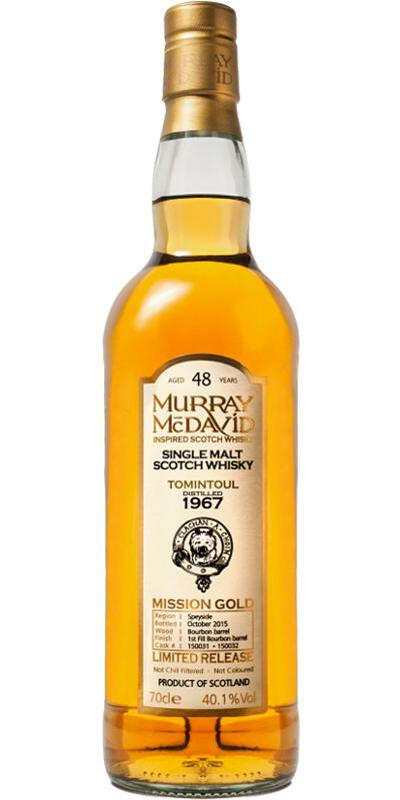 Given the abv was slipping away, as tempting as it must have been for Murray McDavid to hang on for another two years, for the whisky’s sake, there’s been no harm in bottling this now. N: From two refill casks with a 6 month finish in first-fill bourbon, this grand oldie starts fruity with soft-spongey [Irish] mash and sweet mash potato. Those dry floral almost tropical dry fruits are the loveliest. T: Overripe fruit and sugars. Soft-sharp throughout - some water sorts that out significantly yet not surely. F: Bourbon sweet with a soft, wood dryness. I’m pleased to stay it’s never chalky, something that i’ve found residing in much of the standard Tomintoul range. C: It’s not a perfect masterpiece but one can't deny the form and pedigree with a thoughtful/softly softly presentation that includes an extremely complimentary finish. It must be frustrating for the Tomintoul distillery team to see yet another independent bottler [Daily Dram; Dewar Rattray; Blackadder; Edition Spirits; Hunter Hamilton; Jack Wiebers; Liquid Sun; Samaroli; Sansibar,…. ], trump their oldest released whisky to date WB [by eight years] - and then there’s the price! This is priced very reasonably at £338. I wonder how much it would have been as a 50yo? almost a half of a century old. Murray McDavid is back! I thank the German importer Whiskymax for the sample! Soft and gentle on the nose with lingering toffee and plenty of vanilla. Traces of floral notes emerge with a slightly perfume-like touch. followed by a bit of grip form the oak, cinnamon and a whiff of smoke. by a touch of burnt oak and smoke on the tail. spiciness increases with oak, cinnamon and black pepper on the palate. 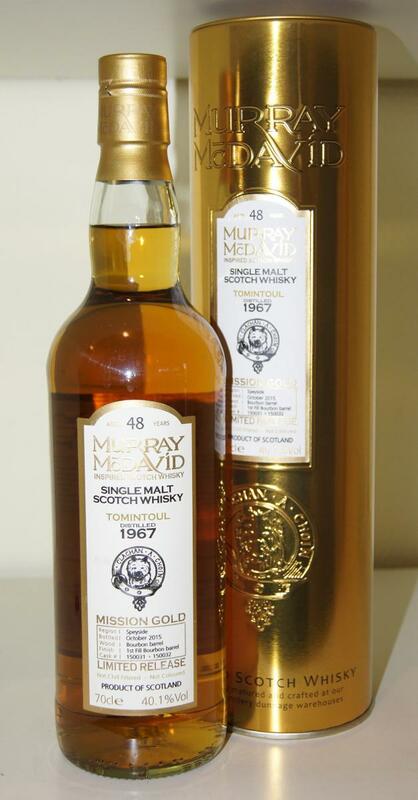 Despite the age, a very harmonious whisky, with clear caramel and toffee notes ... I could smell like that for hours. The nose is soft and delicate. I get overripe apples and pears, herbal teas (various flowery kinds), and a good dose of vanilla. Much bolder than the nose, but nearly five decades has made it uniquely refined. Overripe apples again, "Constant Comment" tea, soft oak, vanilla again, little smoke. Shorter than I was expecting or am I being tricked by how delicate this is? Anyway, more "Constant Comment" tea but sweeter than the mouth. Once in a while I get a little smoke. in a nutshell: Mr.Sandwich just hammerd it. rich coffee, toffee, vanilla, orange oil and a hint of floral notes. Not a firework with tons of different flavours, but everything is just perfect and stays the same through nose, taste and finish. This whisky dwarfes every distillery bottling from Tomintoul you have ever tried. But it is also different.If there would have been not so much angel share due to the age of the whisky, it would be THE best whisky I have ever tasted. The finish is just a little to short for this exceptional flavour. You crave for more of these outstanding flavours. But still one of the smoothest and most pleasant whiskies have ever enjoyed. I am in heaven.